Manchester Metropolitan celebrated the achievements of legal services apprentices at Manchester Law School with the launch of a new network for legal apprentices. Apprentices, staff and employers attended the launch, and special guest Euan Blair attended to present certificates and support the University. Manchester Law School has led the way with legal services apprentices, having taken in its first recruits in 2013. 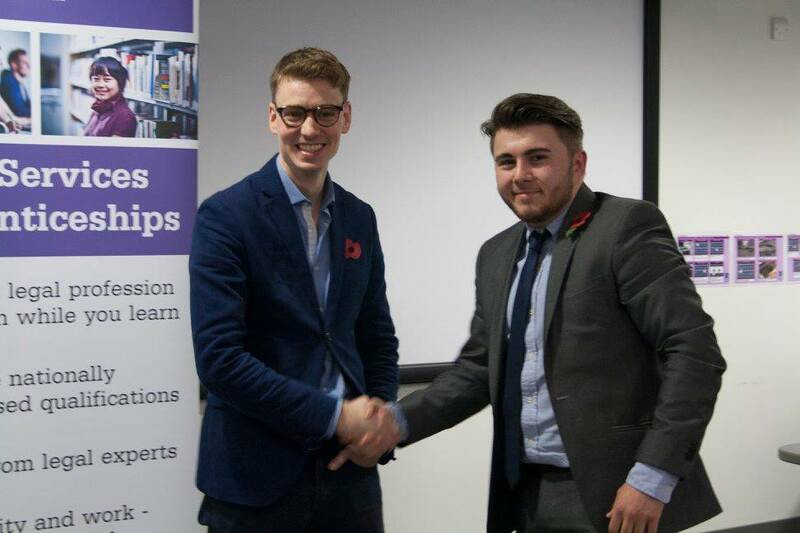 Apprentices, past and present, have set up the Legal Apprentices Network with the support of Manchester Met. The network is one of the first to specifically cater for apprentices working in the legal services sector and it is open to all such apprentices no matter who their employers are or who they train with. The network provides a fantastic opportunity to meet with other professionals and firms, and to find peer support. It also helps hone organisational and networking skills and improve career prospects.